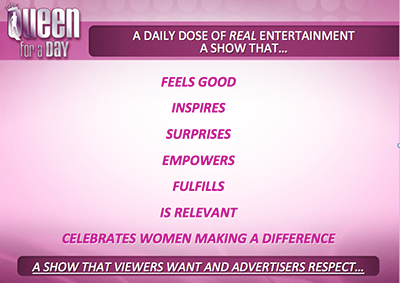 Following the amazing Nielsen performance in Puerto Rico that took Univision from last to first in Women 18-49 and Women 25-54, Queen For A Day is being developed for the U.S. Market. A "Q" score research study conducted in the U.S. among Women 25-54 also delivered very positive results with 85% reporting they liked the "Queen For A Day" title. The show has a proven formula, a ratings track, it's a respected brand and is possibly the most advertiser friendly show on TV. The format is flexible and celebrates women making a difference in their community, in their cities, and even nationally and internationally. The show feels good, inspires, surprises and connects viewers and contestants to their community utilizing today's social media landscape. 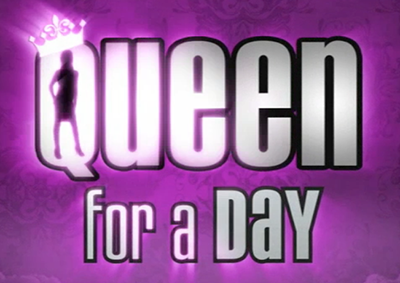 Queen For A Day is the original reality competition format that created a television genre that includes some of prime-time televisions biggest hits. So get ready America, because Queen For A Day will be back soon !! If you are a media executive and would like to see the sizzle reel of our new production of Queen For A Day, please fill out the form below for access.